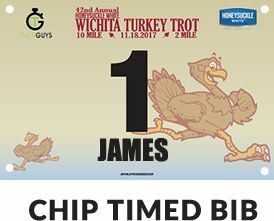 Join us on Saturday, November 17th, 2018 for the 2 Mile, 10 Mile, or Tiny Turkey Trot! 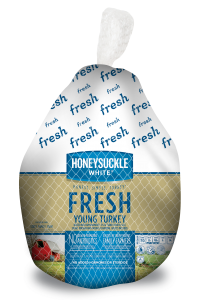 THE FIRST 2,000 PEOPLE TO REGISTER WILL RECEIVE A $20 VOUCHER FOR A HONEYSUCKLE WHITE TURKEY! 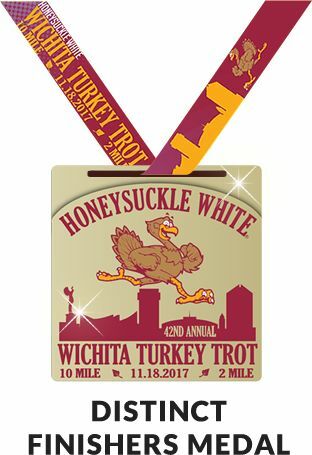 The Wichita Turkey Trot is Wichita’s oldest race and offers the best views of the city! 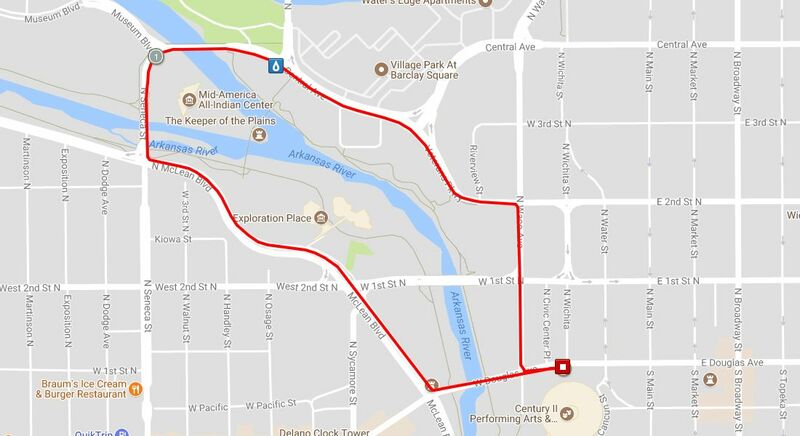 The 2 and 10-mile courses are USATF certified and chip timed, starting in the heart of downtown Wichita. Beginning at Century II, runners will make their way across the Douglas Street bridge, turning to run along the Arkansas River. 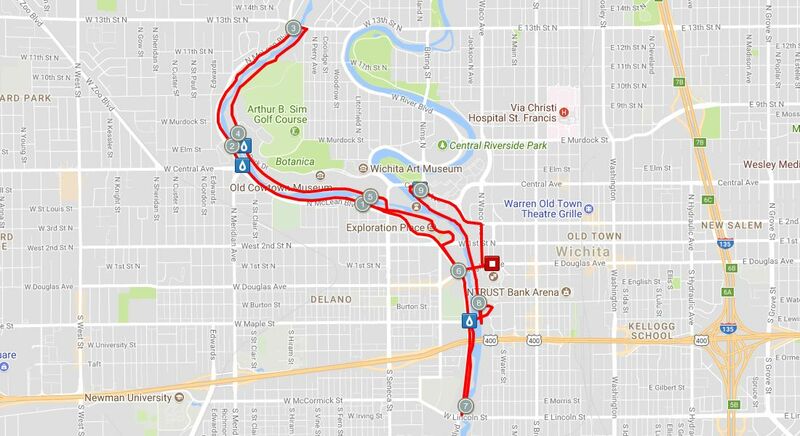 This scenic route showcases some of the best parts of Wichita including Exploration Place, the Keeper of the Plains, Sim Park, and the Veterans Memorial Park before returning runners across the Douglas Street bridge and back to Century II. This is a great course with plenty of aid stations along the way. Want to get out and enjoy the morning with your friends but don’t want to be competitive? Come on out for our easy two mile course. Passing by some of the city’s most iconic landmarks, this ten mile scenic course will have you done before you know it and maybe even a PR. The Tiny Turkey Trot is 250 feet of the most fun for kids 6 and under! All tots registered receive a cotton shirt they may decorate at packet pickup or race morning. Safety of the participants is the top priority of the races and sponsoring organizations. In case of severe and/or inclement weather that may pose an additional threat to the safety of participants and volunteers, the event may be delayed up to one (1) hour from the original start time, changed to a non-timed and non-competitive event, or canceled, depending on the severity of conditions. Due to the costs of putting together an event of this magnitude, no refunds will be given. Refunds are not allowed for any race cancellations prior to race day. If the race is canceled or scheduled to be delayed due to weather prior to race day, all registrants who have registered with a valid email will be sent the updated information. Can I donate my Honeysuckle White Turkey Voucher? Where do I bring my Peanut Butter for the Kansas Food Bank? The Kansas Food Bank truck will be parked in Century II during Packet Pickup on Friday and the Race on Saturday. Please bring any peanut butter or canned food that you would like to donate to the Kansas Food Bank truck. No, we cannot allow dogs at the event due to the large crowd of people and the indoor location. Yes, walkers are welcome in either event! We do like to try to have all Wichita roads open by 10:30/10:45am, so our final finishers in the 10 Mile typically walk at an 18 minute/mile pace or quicker. All registrations come with a chip timed bib, a distinct finishers medal, and a cotton t-shirt which can be upgraded to a tech T for just $5. 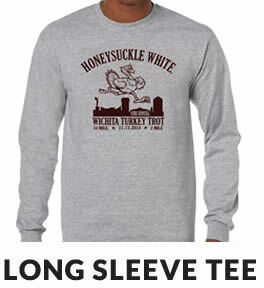 Tiny Turkey Trot participants will get a cotton shirt that they may decorate at packet pickup or on race morning. A great event can’t happen without great volunteers! Everyone receives a volunteer shirt and post race refreshments. Groups and organizations welcomed. Volunteer now!